Dizzy Chicken is a unique restaurant in Glens Falls, NY, providing delectable rotisserie-style chicken cooked over wood fire ovens. Competing with a handful of local restaurants, the challenge for Dizzy Chicken was to tell people about their amazing menu and encourage visitors to try their brand new restaurant in downtown Glens Falls. 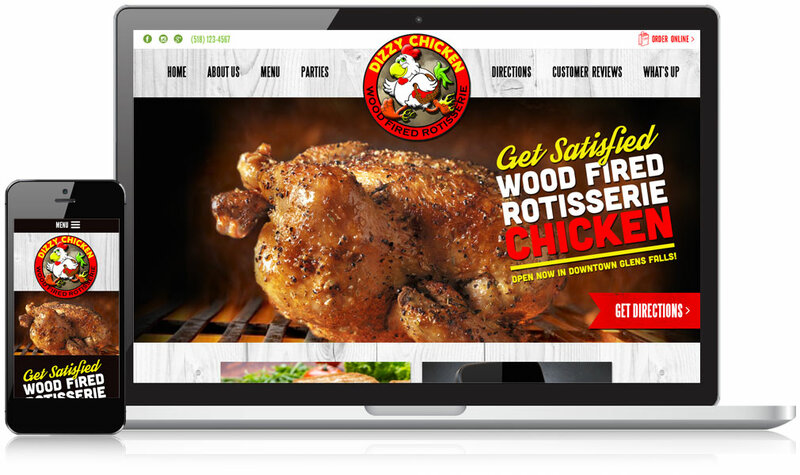 In their search for the right website design company, Dizzy Chicken hired Mannix Marketing to create a one-of-a-kind, modern, easy-to-use website for promoting the new restaurant’s menu, delivery, and catering options, and to make it easy for new customers to find the restaurant online. 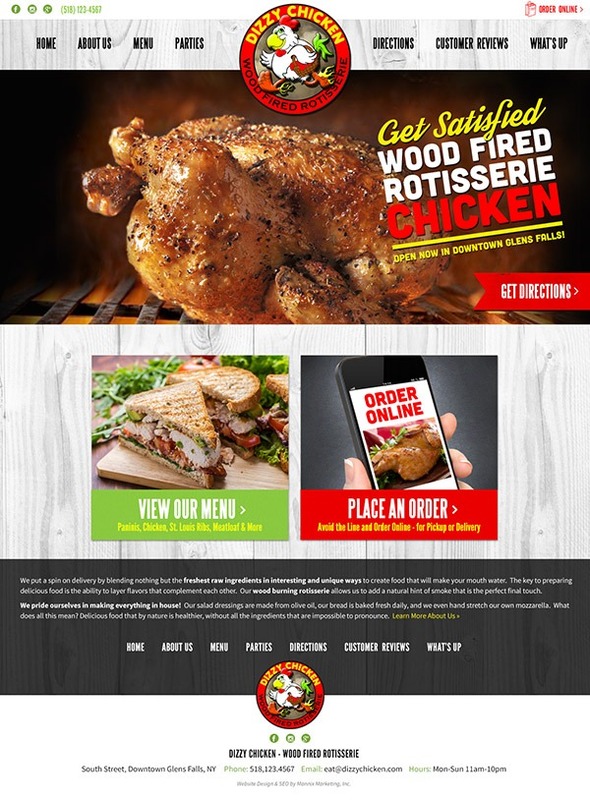 From the home page of Dizzy Chicken’s new website, a mouth-watering photo of rotisserie chicken cooked over a wood fire oven spans the width of the page to capture visitors’ attention. A uniquely designed navigation menu displayed across the top of every page makes it easy for visitors to quickly discover Dizzy Chicken’s extensive menu, catering options, and customer reviews, and obtain interactive driving directions to the restaurant. Throughout the website, prominently displayed calls-to-action encourage visitors to “Call to Order” and explore Dizzy’s menu. Built with mobile users in mind, the new responsive designed restaurant website features optimal layouts which display the content in an easy-to-read format while providing a user-friendly experience on desktops, tablets, and smartphones. Further, the phone numbers use a special click-to-call functionality which lets customers quickly and easily order directly from their mobile device with the click of a button. While getting found in the search engines is a great way to attract new customers, increasing a restaurant’s placements for competitive keyword phrases can take time- especially when you have a brand new website! To help Dizzy Chicken start gaining traction and showing up for important keyword phrases in the search results, we incorporated local, restaurant-related keywords throughout the key areas on their new website.